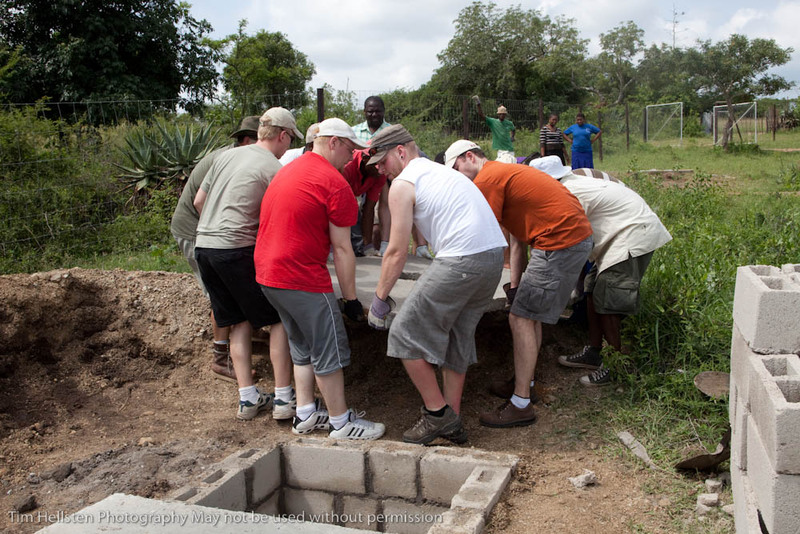 * We moved the floor onto the latrine and the walls are half built. * The 20 trees arrived and are ready for planting tomorrow (Saturday). 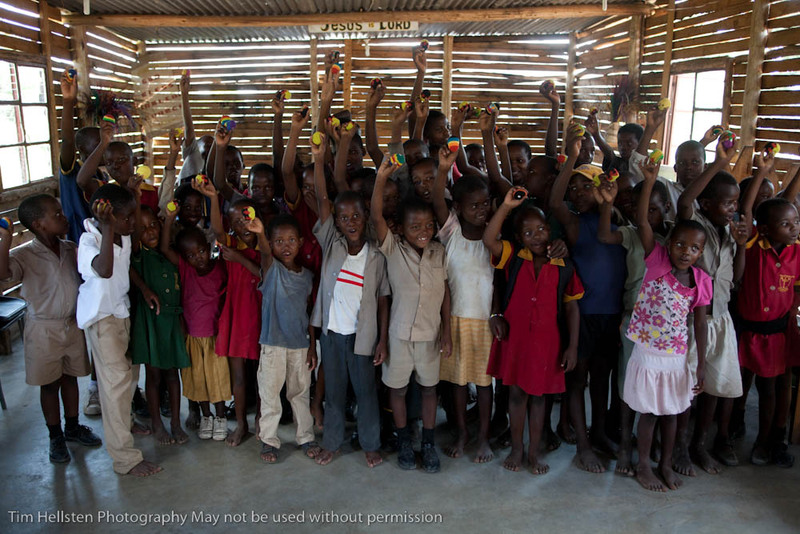 * The kids also received their vitamin made possible by our sponsor dollars. * We did 3 more home visits. * We finished clearing the field of stumps. Wow! Talk about hard work. It’s ready to be plowed tomorrow. 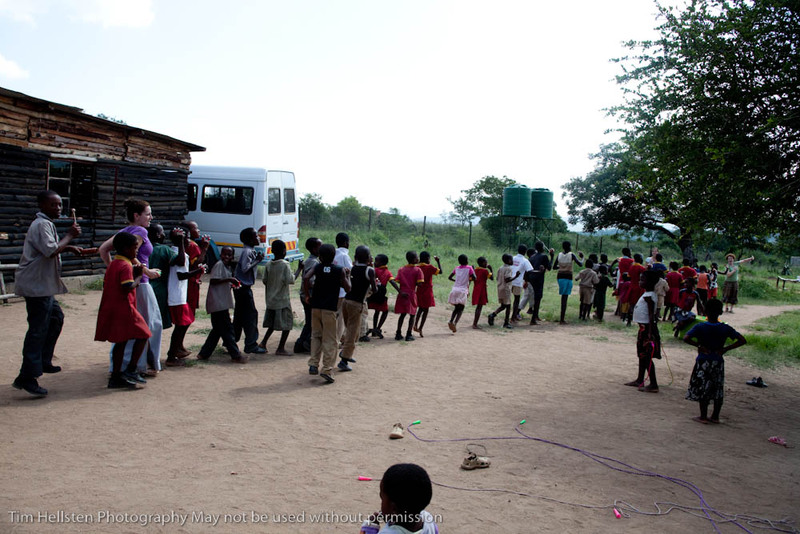 * We conducted a morning and an afternoon VBS…which included bracelet making and a beautiful parade of kids! 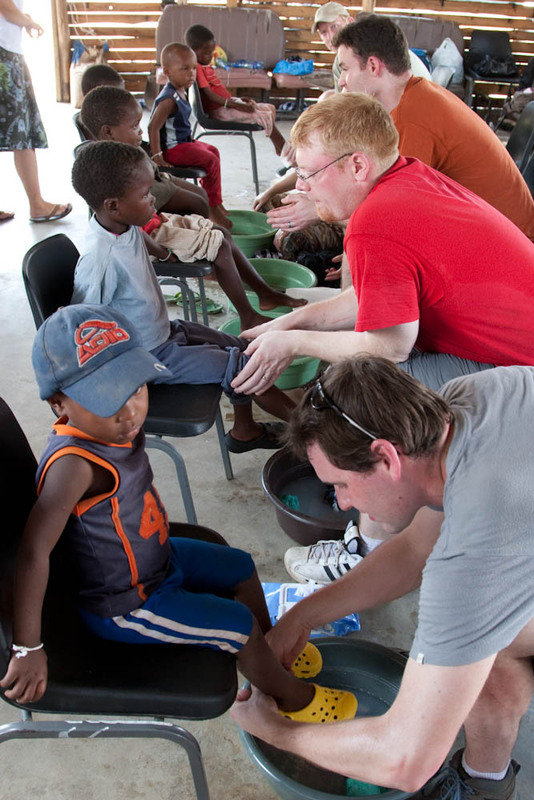 * We had a foot washing and shoe fitting for close to 80 kids! * We arranged for a space-age paint to be applied to the roof of the church. NASA uses it and it reflects 68% of the heat rays so the church stays cooler. We’ll have it painted tomorrow. * The $4000 solar pump began to be installed with the hoses being run to the cisterns we mounted yesterday. * Pastor Todd met with Pastor Peter to go over drawing for the future church of Enaleni. Pastor Peter is dreaming BIG! Pastor Todd also met with the CEO of Kingdom Builders, the ministry that will help build the church in the next year or two. * We went out for dinner to a restaurant in Manzini…came back to our compound for a quick de-brief…blog reading (THANKS FOR ALL THE NOTES! THEY MEAN SO MUCH! )…a late night blog update…and off to bed to get some rest before our big party and gift day tomorrow. 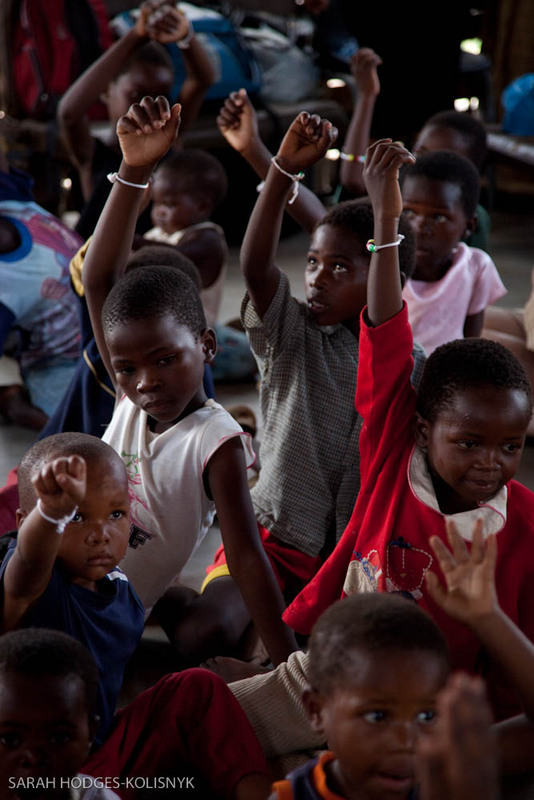 Sean – Today at supper we were talking to our Swazi bus driver, Elliot. He was telling us about how he saw God’s love in action when our church started taking on Enaleni by sponsoring children. He told us that since we started helping out the CarePoint many souls have been saved. Now with us being at Enaleni he sees God’s love coming out of our hearts. 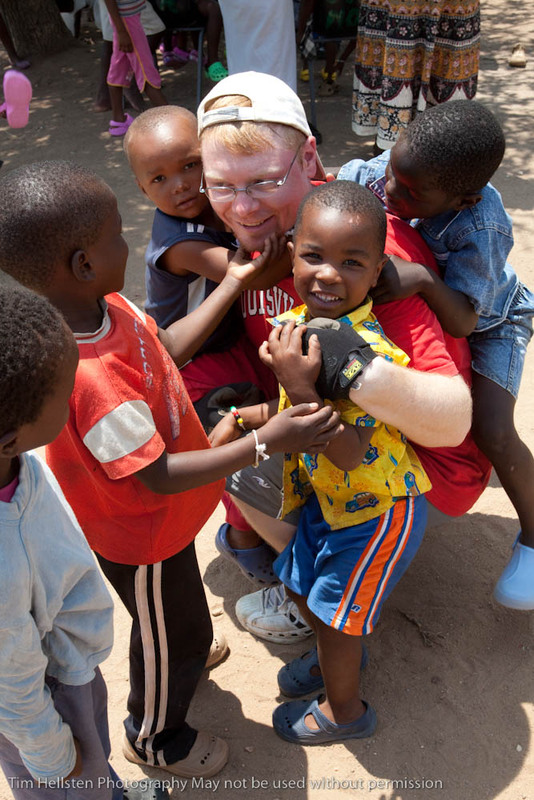 He said…”We are all brothers and sisters in Christ no matter where we live or what color our skin is.” He was so thankful for us and the difference we are making in Swaziland. Ken – The last two days have been very rewarding for me. Yesterday Tanya and I had the humbling experience of visiting our sponsor child’s home, and today was an unbelievable emotional yet joy filled experience for me as I had the privilege to wash the feet of some of these children including our sponsor child and to pray over each of them. It’s an experience that I will carry with me forever. 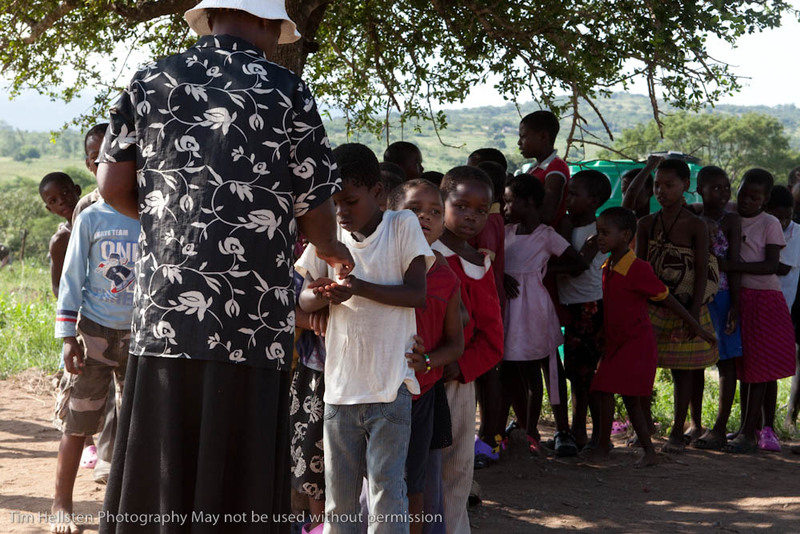 Michael – Today I had the opportunity to wash the feet and give new shoes to some of the children at Enaleni. It was an awesome and humbling experience to take part in this, and to pray a prayer of blessing over each child. It will be something I remember forever. On a couple of them it took three or four tries until we found a pair that fit them properly, but I could see afterwards that they really enjoyed their new gifts. out to be the biggest moment for this boy, dare I say, ever. 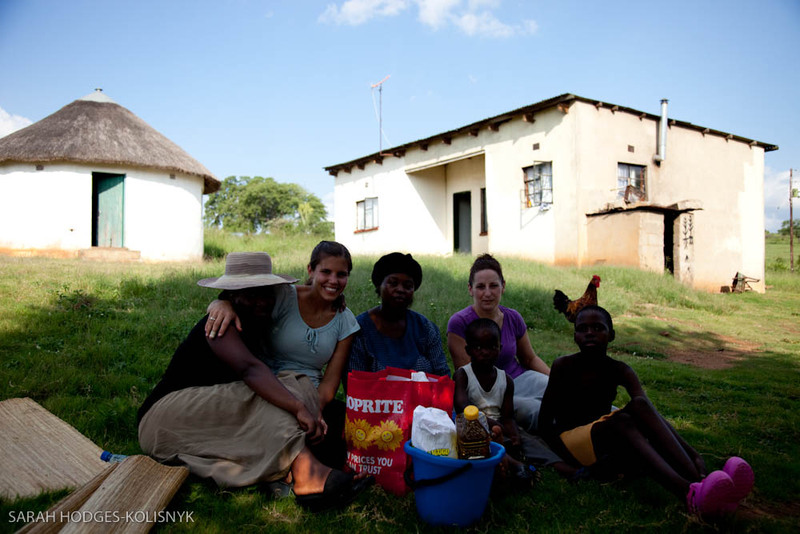 It really put into perspective for me, the kinds of things God is doing in these people’s hearts through our work here. It broke my heart of course, but it was good to SEE us having a long term impact on these kids, which is our goal. 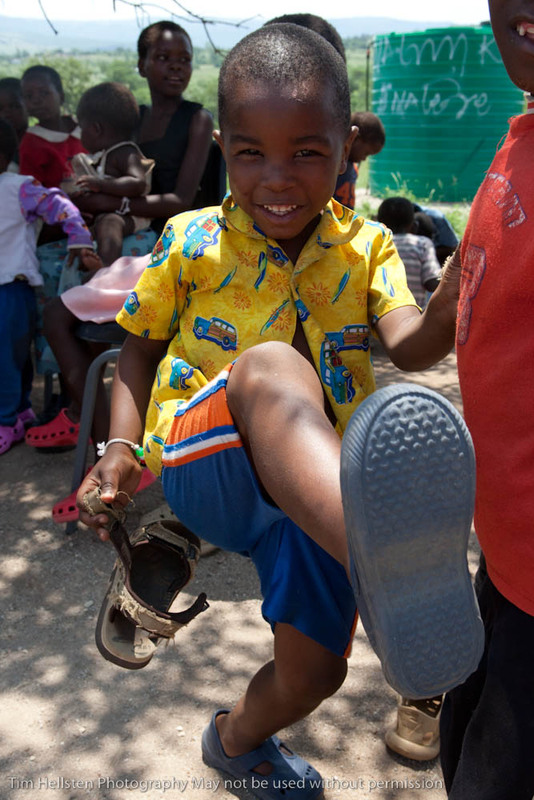 What WAS encouraging was the fact that he was wearing a pair of brand new crocks that we handed out to all the sponsored children at the care point so I knew he had a sponsor back home in Winnipeg so he is receiving support! Praise the Lord! Rachel – Today I found out that I would be going to my sponsor child’s home and the feelings were overwhelming. This was even more special as his mother has just passed away and he hadn’t been to the care point often so time spent with him was precious. The walk to his home was very meaningful, we spent time together and I tried to interact with him. His aunt who he lives with was very welcoming and so thankful for the gifts we offered. God has brought us together from two different sides of the world and I am so very thankful for this opportunity. I will cherish this memory for a lifetime!! After reading through your update I’m just sitting and trying to get a handle on what I’m feeling. The impact you are having on those children, your church, and, if you read one comment left yesterday, people who don’t even know Riverwood (yet), is just too much for words. God is so over all of this and right in our midst that our human thanks for being there will mean very little in the light of our Lord & Master's eternal thanks that is sure to come your way. God bless each of you and have an awesome next day in Him! Thinking of you all and praying daily for God’s presence and provision to be very evident. Thanks for sharing your experiences with us through pictures and words. Blessings to each and every one of you! I have tears rolling down my cheeks as I read about your day. I can just imagine how God’s arms have become the arms of this team, to hug and love on these precious children. What unbelievable moments you have to cherish. God bless you all, I know that he already has…CheersTaraPS Sean and Leslie: Matthew is being such a good boy and Maggie is getting lots of treats. We’ll be at the children’s museum tomorrow. The photos are amazing. The photos dont need any explanation. They are priceless in what they speak. The story it tells is amazing. Absolutely amazing work and priceless memories you will receive and give to these people. My 2 older kids have lots of questions and try realize how fortunate we really have it. My heart goes to all. Fabulous work you are doing. Hey Team!You all look so fantastic! i’m so proud of you. You must also have a really amazing and capable leader!Anyway…hope the “Ann-bulance” is doing a good job of keeping you healthy and all your boo-boos bandaged.I pray that Doug finds some speed so he’s not the slow one…and that Nick doesn’t fall into his dark past as being a rebel leader.If i can give you a bit of a warning…watch out for the Black Mombas and Cobras…Oh ya…and the scorpions…and Stephanies witty humor hidden under that quiet (tatooed) demeanor.Hope Rachel isn’t crying too much…and Tanya isn’t eating everyone’s treats on the sly (that is one girl you gotta watch).Anyway…i think the world of you all and am so incredibly proud of you! It’s 7:15 in the morning in wpg, I’ve been up for a while, getting ready to start my day, you guys are well on your way in your day, and doing remarkable things, that make my life here seem……… well less important somehow. I am constantly reminded of how much excess I have, as I go to the grocery store and pick out whatever I want from hundreds of thousands of items, and pay for it with the money I have, to opening my fridge and picking something out, to turning on clean hot water for my shower, to reaching for intact shoes and intact clean clothing, to sitting relaxing in front of my One of 4 TV’s. I am grateful to the Lord for the many many many blessings He has bestowed on my and my family and realize now more than ever how very very rich I am. i am the rich man described in the bible. What am I here and not there?I am not able to go there physically and do that work, but I can stand in the gap and lift all of you to the One True God, and I am going to do that now. May God bless each of you today more than even yesterday, and may His light shine one the precious folks you are ministering to even more than yesteday, and tomorrow more than today.talk to you soon.TTFNLove Cheryl.Good morning Mitch, I love you, I miss you and Dad and I can’t wait to see you. The dogs are fine, they miss you too.